© Niyyar and Vachharajani. ; Licensee Bentham Open. A standard teaching and learning process in the medical field involves peer-review and evaluation of fundamental mistakes that physicians encounter in clinical practice. The current images are examples demonstrating improperly placed TCVC providing a resource to the growing international interventional nephrology community to learn and preferably avoid duplicating them. The catheter cuff in Fig. (1) was not only placed deep in the subcutaneous tunnel, but the catheter hub was pushed in all the way up to the exit site. A deeply placed catheter cuff makes removal of these catheters difficult when the TCVC is no longer needed. The catheter in Fig. (2) was removed when it was no longer needed, revealing the trimmed off venous tip of the split-tip design. The tips are manufactured with a smooth surface to avoid endothelial trauma. Trimming of the catheter tip can lead to ragged edges that can cause endothelial trauma and potentially lead to stenosis and thrombosis. Moreover, the venous tip in a TCVC with split-tip is designed to minimize the recirculation during hemodialysis, and trimming of the tip leads to inefficient hemodialysis . 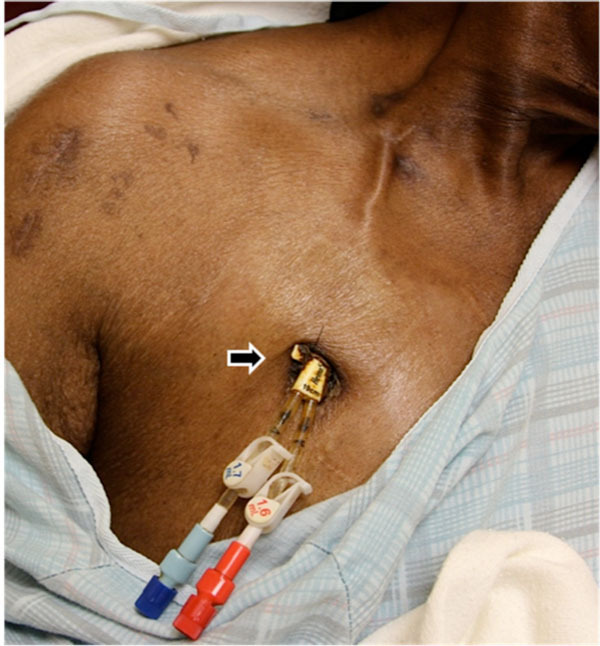 Catheter hub (marked by arrow) at the exit site (courtesy: Shukhrat Artikov, MD). 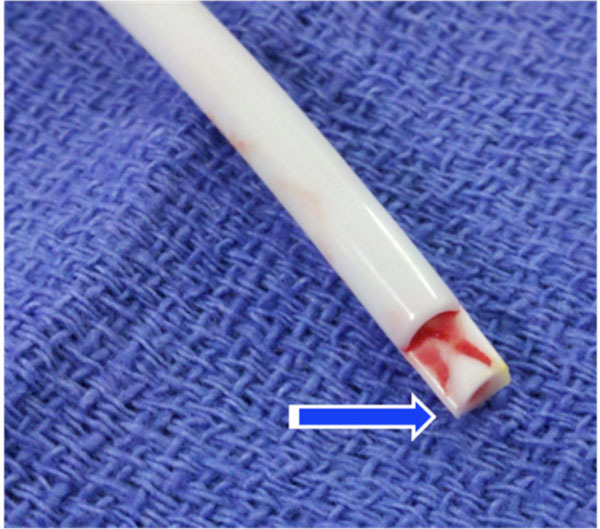 Trimmed venous tip (marked by arrow) from a split-tip designed tunneled central venous catheter. The authors believe that both these cases were result of poor techniques and judgment that required improvisation and compromised patient safety. The catheter selected in Fig. (1) was probably too short and hence needed the entire length to be placed in the subcutaneous tunnel so the tip could be positioned in the mid right atrium to provide adequate blood flow on hemodialysis. The catheter in Fig. (2), on the other hand, was probably too long and had to be trimmed so that the tip was positioned in the right atrium and the cuff within 1-2 cm from the exit site. These cases serve to highlight the importance of meticulous planning while placing tunneled central venous catheters and defining the location of the exit site, taking into consideration both the height of the patient and the length of the catheter . Knuttinen MG, Bobra S, Hardman J, Gaba RC, Bui JT, Owens CA. A review of evolving dialysis catheter technologies. Semin Intervent Radiol 2009; 26: 106-4. Niyyar VD, Work J. Interventional nephrology: core curriculum 2009. Am J Kidney Dis 2009; 54: 169-82.